A fine Mardi Gras festival! 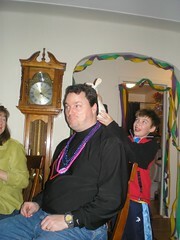 We had a lovely Mardi Gras party last night over here. This is a new thing for us, but I can see it becoming a regular thing for us. Mardi Gras has all the elements that both Annette and I enjoy: cheap jewelry, bright colors, masks, quasi-pagan/religious rituals, great music, and fine food and drinks. We had Jambalaya and Muffaletta sandwiches and Annette’s mom’s famous stuffed jalapeno peppers and a whole bunch of other stuff. Darn good eats. Oh, I also made a King Cake. Ours had a Chuck E. Cheese coin in it, which I thought was a nice touch. Congrats to Michelle on being named queen of the party for finding the coin! I thought we had a nice sized crowd– about 23 or 25 or so– and a nice mix of folks from work, from the neighborhood, and more or less friends of friends. Oh, and we even had some live music from Gerry and Jim on guitars. They wouldn’t play “Freebird,” though. The kiddies seemed to have fun too, and no one got an eye poked out. Though Will did get hit upside the head with a wooden sword. And now, it’s time to engage in some lent-like behavior. Back on the diet…. Not only would they not play Freebird, they also refused to play Dark Star. PS… I have a new blog and Drunk Againis no more. Boo-hoo…I miss my fun colleagues! Looks like a hoot!